The Sony Cyber-shot DSC-G1 was a surprise announcement back at PMA in February, and is only starting to appear on store shelves now. The Sony G1 digital compact camera is a curious mix of exciting and rather more humdrum features. It offers a very large 3.5 inch LCD screen with an amazing 921,000 pixels, providing much higher resolution than most cameras. On the other hand, the DSC-G1 "only" has a 6 megapixel sensor, losing it marks at least from a marketing point of view, and the zoom is just the standard 3x optical model, equivalent to 38-114mm on a 35mm camera. Back to the plus points, the Sony G1 has 2GB of built-in memory - yes, you read that correctly, 2Gb of memory - enough for 600 images at the highest resolution available. The DSC-G1 offers Wi-Fi connectivity to any DNLA certified device and can cleverly connect to other G1 cameras without requiring an existing Wi-Fi hotspot. In addition the DSC-G1 features what Sony call "Double Anti-Blur", which is actually optical stabilisation via Super SteadyShot, and electronic stabilisation via the ISO 1000 High Sensitivity mode. Add to all of this a rather high price tag that puts it in direct competition with an entry-level DSLR, and does the Sony Cyber-shot DSC-G1 provide a compelling multimedia package? Carry on reading to find out. The first and main thing that strikes you about the Sony Cyber-shot DSC-G1 is the enormous 3.5 inch LCD screen on the rear of the camera. Sony have cleverly made the screen the focal point of the G1 by positioning no controls at all on the rear, that is until you slide the body open to reveal a vertical set of buttons on the right hand side. The LCD is a joy to use, the best that I've ever seen on any digital camera. With a staggering 921,000 pixels, it provides a 4x increase in resolution compared to most competitors, resulting in a buttery smooth, grain-free image that is well-suited to showing off your photos to friends and family. This high-quality screen undoubtedly contributes to the high-price of the Sony G1, but it's a welcome development that other manufacturers will hopefully adopt in the future. The Sony Cyber-shot DSC-G1 is a wide (when fully open) and bulky digital camera that just about fits into the palm of my average sized hands, measuring 93.3mm (W) x 71.7mm (H) x 25.3mm (D) and weighing around 200g without the battery fitted. With an all-silver aluminium alloy body, it's bigger and heavier than previous Sony models that I've reviewed, but also exceedingly well built. The Sony Cyber-shot DSC-G1 is definitely the most well-constructed Sony digicam that I've seen (which is no mean feat). The Sony G1 is purely a point and shoot camera with no manual controls, but it's still quite complex in terms of its design. There are 16 external controls in total, located on top of the body and to the right of the LCD screen (as viewed from the rear). Pushing the Open(Camera) switch and camera body to the right reveals the zoom buttons and 6 key controls on the rear, whilst there is a small joystick and 4 more buttons on the right side of the body. I instantly took a dislike to the positioning of these 4 controls (Disp, Back, Menu, Home) and the joystick, as it's impossible to see what each one is unless you tilt the camera, and each one is orientated at a 90 degree angle, making it even more difficult to use them. The small joystick is also very fiddly to use, with a spongy action. With no room on the rear of the camera, Sony have been forced into this compromise, to the detriment of overall ease-of-use. 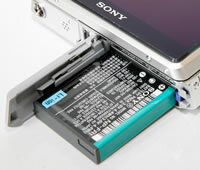 Sony want you to use the G1 as both a camera and a photo storage device. With a massive 2Gb of built-in memory that can store up to 600 full-resolution images, it's certainly possible to leave all of your photos on the camera, and share them with other people via the fantastic screen. Such a headline-grabbing specification does come at a literal price though, as the 2Gb storage is the second main reason (after the LCD screen) for the enormous price tag, and I would argue that it's of less benefit to the user. Storing all of your images on the camera is fine unless you lose it, the camera is stolen, or it breaks down. If you do use the G1 in this way, remember to regularly backup your images onto another storage device. Also, 2Gb and 600 images sounds like a lot, but unless you edit your portfolio of pictures quite heavily, you'll soon use up all of the space on offer. Finally, a 2Gb Memory Stick Duo Pro card currently only costs around �20, so it would be much more cost-efficient to just buy several of these. The 2Gb of storage is a nice idea by Sony and a great way of sharing your best photos, but the hefty price premium is not really worth paying. 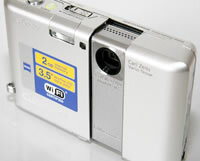 A sticker on front of the Sony Cyber-shot DSC-G1 declares that this is a Wi-Fi certified camera. The G1 is compliant with the DLNA (Digital Living Network Alliance) standard, enabling it to connect to any DNLA-enabled device via a wireless LAN. In addition, Ad-hoc mode allows you to share your photos with up to 4 other Sony G1 cameras without having to be inside a wireless hotspot. Pressing the WLAN button on top of the camera automatically establishes a wireless network for the other cameras to connect to. You can then take a picture and simultaneously share it with another camera, or choose existing pictures to exchange and transfer. If you already have a wireless access point, you can connect to the network and share images with other DNLA devices e.g. a DLNA TV set or a computer. I didn't have another Sony G1 to test the sharing features, but the camera did find the wireless network and download images onto my laptop with no problems. There is an innovative feature on the Sony Cyber-shot DSC-G1 that aims to make life easier for you. This camera has an optical-based anti-shake system called Super SteadyShot. Turn it on and the Sony Cyber-shot DSC-G1 automatically compensates for camera shake, which is a slight blurring of the image that typically occurs at slow shutter speeds. You don't notice that the camera is actually doing anything different when anti-shake is turned on, just that you can use slower shutter speeds than normal and still take sharp photos. Sony seem to have realised the importance of this system, as it is turned on by default in the menu system. You can see some example of the Super SteadyShot system in action on the Image Quality page. Thankfully leaving the anti-shake system on didn't negatively affect the battery-life, with the camera managing over 250 shots before the battery needed to be recharged. If you have never used a digital camera before, or you're upgrading from a more basic model, reading the comprehensive and understandable manual before you start is a must. Unfortunately Sony have chosen to cut costs and supply the full manual as a PDF on the product CD, rather than in printed format. Only a brief 40 page guide to the basic operation of the camera is supplied in printed format. The 3.5 inch, 921,000 pixel LCD screen is the only way of framing your shots, which is a problem in very bright lighting conditions when it can be difficult to see the image on the LCD. The various icons used to represent the camera settings are clear and legible, although a little on the small side considering the massive LCD screen. 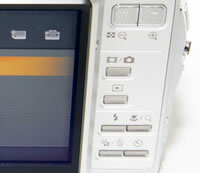 The main camera menu system on the Sony Cyber-shot DSC-G1 is accessed by pressing the Menu button on the side of the camera. 8 commonly used features are displayed in a vertical row of icons, including program mode, exposure compensation, ISO speed and metering mode. At the bottom is the Camera Set. option, which displays another 7 options in a list format, including image size, AF mode and Super SteadyShot. As the Sony G1 is also a multimedia device as well as a camera, there's a Home button below the Menu button which accesses all of the main features. These include image viewing, MP3, Wi-Fi, and sharing options, which are displayed in a slick icon-based interface. Once you become accustomed to the split between the Menu and Home buttons, the G1 has a very nice user interface that suits the overall feel of the camera. The performance of the Sony Cyber-shot DSC-G1 is good in some areas, bad in others. The start-up time from turning the camera on to being ready to take a photo is very slow at around 5 seconds, and it takes 2 seconds to zoom from the widest focal length to the longest. On the other hand, focusing is very quick in good light and the camera happily achieves focus most of the time indoors or in low-light situations. The visibility, refresh rate and pixel count of the 3 inch LCD screen are top class. It takes about 1 second to store an image, allowing you to keep shooting as they are being recorded onto the memory card, although there is occasionally a short LCD blackout between each image. The Sony G1 has a fast continuous mode that takes up to 7 images at 3fps, before the camera pauses for several seconds while the buffer is cleared. Overall the Sony Cyber-shot DSC-G1 is quite quick in terms of operational speed. Once you have captured a photo, the Sony Cyber-shot DSC-G1 has an excellent range of options when it comes to playing, reviewing and managing your images. You can instantly scroll through the images that you have taken, view up to 100 thumbnails at once, zoom in and out up to 5x magnification, view slideshows with music, set the print order, delete, protect, rotate and resize an image. You can also add custom labels to images, export an image from the internal memory to a memory card, and view shooting details about a particular image. The Display button toggles some limited information about each picture on and off. Photos are automatically ordered in albums according to the date of shooting. The Sony G1 features something called intelligent image searching, which is essentially a powerful Find function that can search for images based on either a label, keyword or date. In addition similar pictures can also be located by subject materials, the dominant colour in an image and even human subjects in the image (you need to use the Album Editor software to activate this feature). In summary the Sony Cyber-shot DSC-G1 is a unique digital camera with features that will appeal to the casual snapper who's looking for a convenient way to take and share their photos. It is more difficult to use and less responsive that it should be though, especially considering the target market that it's aimed at. PhotographyBLOG is a member of the DIWA organisation. Our test results for the Sony Cyber-shot DSC-G1 have been submitted to DIWA for comparison with test results for different samples of the same camera model supplied by other DIWA member sites.